Word on the street is that Starbucks has a new Salted Caramel Hot Chocolate available that is sure to excite any and all fans, myself included, of the legendary sweet and salty combination. According to their Web site it combines "the flavors of buttery caramel and smoked sea salt," which explains why it's called Salted Caramel Hot Chocolate. I haven't tried it yet, but I have it on good authority that it's delicious! For those of you who want to know exactly how many calories you're drinking (aka gluttons for punishment), Starbucks supplies a nutrition calculator for each of their products on their Web site. Enter your specifics (large or small, whipped cream or plain, soy milk or whole) and, voila, it gives you all the stats! 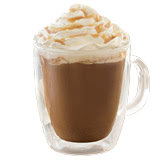 Pretty neat or maybe not so neat, if you're getting a large hot chocolate with whipped cream! 760 calories? Yikes! Click here for more information. I love the idea of salted caramel in hot chocolate! What a great post! Thanks so much for the invite to guest blog...right now unfortunately my life is crazy busy, but when it slows down I might be able to do it! Thanks again! Unfortunately, it goes out of season after December. Rats! Orla Kiely . . . at Target!! !